An effervescent but edgy rom-com about love, career, the insecurities men and women felt (and, sadly, still feel to some extent) around burgeoning feminism. 114 min. MGM. Director: George Stevens. Cast: Spencer Tracy, Katharine Hepburn, Fay Bainter. TV addicts of the 1980s will recall the zeitgeist being seized by rom coms pitting salt-of-the-earth alpha males “versus” cultured alpha females (Cheers' Sam and Diane, Moonlighting's Dave and Maddie, et al). These shows were, of course, crafted by enthusiasts of those show's theatrical and cinematic "battle of the sexes" prototypes: The Taming of the Shrew, sure, but even more so films like His Girl Friday and Woman of the Year, both reissued by the Criterion Collection in 2017. The first of nine films that paired Golden Age Hollywood movie stars Katherine Hepburn and Spencer Tracy, George Stevens' Woman of the Year remains an effervescent but edgy rom-com about love, career, the insecurities men and women felt (and, sadly, still feel to some extent) around burgeoning feminism. The famously compromised ending doesn't quite sit right, but it is a resolution about the compromise inherent in any marriage of two individuals, and needn't be taken as a defeat (more on that anon). Although gender tensions sit at the foreground, Woman of the Year also stages a comical clash of “high culture" and "low culture." Hepburn and Tracy play Tess Harding and Sam Craig, columnists at the fictional "New York Chronicle": she writes the "NOW" column reporting on global current events; he writes the “Man-About Sport” column. She's a diplomat's daughter, a worldly woman; he’s “a bundle of nerves” (a good description of Tracy's anxious comic persona). When shots are fired between the two, a "merry war" of words becomes the overture to sexual heat and wishful romance. Flipping the script on gender assumptions, modern woman Tess would just as soon bed Sam, while old-fashioned Sam embraces propriety and has his eye on marriage. Sam gets his way when Tess accepts his proposal, but she "wears the pants" immediately thereafter, with a farcical wedding day that's crowded with the wedding party's career obligations and thus threatens to withhold the sexual release both have been craving. The script includes tongue-in-cheek misogyny from out of the mouths of the unenlightened (“Women should be kept illiterate and clean, like canaries”), and Sam consistently retains the moral high ground. Tess is wildly insensitive, not least for the description of the titular award (“America’s Outstanding Woman of the Year”) as “the most wonderful thing that’s ever happened to me” not long after marrying Sam (as she continues to refer to herself as "Miss Harding"). She also adopts “a little Greek refugee” boy without consulting her husband, and the child is doomed to neglect. Despite his legitimate beefs, Sam can't help but take as a threat to his masculinity the fact that Tess proves such a formidable woman in every respect (as well as, ironically, what attracts him to her). That complex is on him, and he has to work through it to get to the real issue of achieving a liveable balance with his spouse. In a series of third act scenes, Tess gains perspective, first when Sam forces the issue, and then through the example of the feminist aunt (Fay Bainter) who raised her ("Success is no fun unless you share it with someone"). In a memorable, lengthy, and mostly wordless sequence that's squirmy in its politically incorrect implications but also pretty amusing (think I Love Lucy), Tess attempts an overcorrection by getting in the kitchen and spectacularly failing to prepare breakfast in bed for Sam. It's a worrying comedown of ordinariness (and humiliation) for an extraordinary woman, but on the other hand, Sam has spent the entire picture feeling humiliated and dismissed. In acting against her character, Tess plainly (though misguidedly) makes a gesture of ultimate sacrifice to prove her love. This ending was a rewrite by Stevens and studio hands (with a hapless polish by the credited screenwriters) after a dissatisfying preview. Indeed, it would be more satisfying to modern audiences for Tess to reorient the relationship rather than Sam, who gets to straighten out his wife in the end, but at least the key line by which Sam does so comes from the original ending: a question Sam asks of Tess in the last minutes of the movie that’s remarkably progressive and deeply romantic. Stevens stages a buoyant comedy, though he also has plenty of help from the enormously witty screenplay of Ring Lardner Jr. and Michael Kanin (from a story developed by Kanin's brother Garson) and, of course, from his stars and the kind of colorful supporting cast typical of comedies of the time (exemplified by another study in contrasts: William Bendix as former boxer/current barkeep "Pinkie" Peters and Dan Tobin as Tess' refined male secretary Gerald). Did this story of a great love inspire the partial fiction that was Hepburn and Tracy’s great real-life "romance"? Clearly, the answer is yes. Although Stephanie Zacharek's liner notes essay in Criterion's release embraces the narrative of the never-married but long partnered Kate and Spence's true love, there's plenty of evidence that the pair had a loving but sexually chaste partnership formed more for career expedience, for show and show business, than for true romance. None of that really matters to Woman of the Year, which remains a mesmerizing testament to the chemistry of a great screen team whose special rightness spilled over into its own functionally dysfunctional real-life "marriage" of compromise. Criterion awards Woman of the Year with a fantastic special edition Blu-ray. I've never seen this film look better: the digitally cleaned-up 2K image retains glorious film grain and perfect contrast with no compression artifacts and lovely detail and depth. Needless to say, the film takes a giant leap in A/V quality from the previously available, standard-def DVD from Warner. That extends to the similarly scrubbed audio, presented in LPCM Mono. Leading off the bonus features is a new interview with "George Stevens Jr." (6:13, HD) on his father's work and personality. Most intriguing is a 1967 audio interview with "George Stevens" (16:54, HD) discussing his work on Woman of the Year and, in particular, the controversial ending. A new interview with George Stevens biographer "Marilyn Ann Moss" (14:23, HD) goes into more detail on the filmmaker's work, particularly the feature at hand, but also how his career shifted after WWII to drama. "Katherine Hepburn: Woman of the Century" (20:08, HD) is a new interview with writer Claudia Roth Pierpont on Hepburn's career and persona, illustrated by film stills and clips. 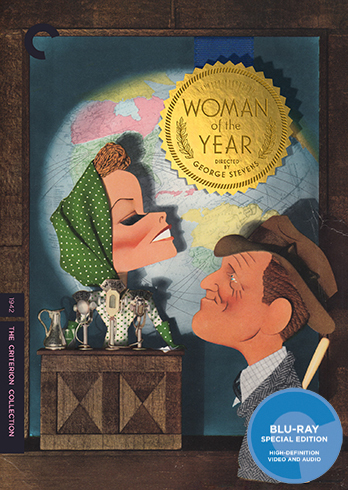 Criterion also secured the rights to two longstanding video tributes: George Stevens: A Filmmaker’s Journey (1:51:30, HD), a 1984 documentary by George Stevens Jr. (1:51:30), and The Spencer Tracy Legacy: A Tribute by Katharine Hepburn (1:26:34, HD), a documentary from 1986. Rounding out the disc is the film's "Trailer" (2:29, HD). As usual, the package includes a booklet with photos, film credits, tech specs, and an essay, in this case by critic Stephanie Zacharek. All site content © 2000-2019 Peter Canavese. Page generated at 04/18/2019 01:54:27AM.